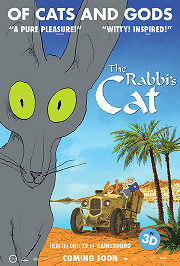 From January 18 to 25, the GKids (Guerrilla Kids International Distribution Syndicate) distributor gave the 98-minute French animated feature The Rabbi’s Cat (Le Chat du Rabbin), directed by Joann Sfar and Antoine Delesvaux, produced by Autochenille Production (a studio set up in 2007 by Sfar and Delesvaux to make this movie), and based on Sfar’s French five-volume graphic novel of the same name (volumes 1, 2, and 5 of it, to be exact), a one-week American limited “general” distribution, in San Francisco, Los Angeles, and San Diego on the West Coast. It will have an East Coast release in mid-March. The original French release, on June 1, 2011, won the Annecy Crystal for Best Feature at the 2011 Annecy International Animated Film Festival, and the 2012 César Award (“the French Oscar”) for Best Animated Film. It had a one-week release in one theater in America on December 7-13 to qualify for 2012 American film awards, and was nominated for the Annie in two categories, Best Animated Feature and Outstanding Achievement, Directing in an Animated Feature Production. On January 20, my sister and I went to the Laemmle Town Center 5 in Encino to see The Rabbi's Cat, in French with English subtitles. It was playing for a week, and has gotten a mixed but generally favorable illustrated review in LA Weekly, January 18-24, 2013, the major citywide free alternative newspaper. Rotten Tomatoes gave it 93%.